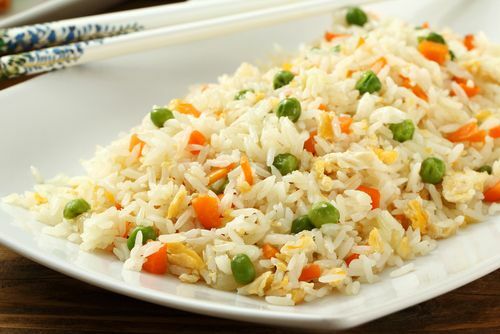 Vegetable Fried Rice - is aromatic,flavorful and delicious rice recipe. It changes the way to eat Delicious rice at home and it takes a less time to prepare.This recipe combine the nutty flavor of rice with the fresh taste of carrots,baby peas and some other vegetables.You can add your choice of fresh vegetables in Veg Fried Recipe. Step 1: Take 1 cup of Basmati Rice, rise rice very well until the water runs clear of starch and soak them in water for at least 30 minutes.Then drain the water and keep aside. Step 2: Brings 4/5 cups of water add 1/2 teaspoon salt and add rice.Simmer on low flame without a lid cook the rice til they just cooked. Step 3: Rice strain in a colander for let them completely cool.cover them keep asides. Step 4: When the Rice cooling ,chop veggies finely and keep aside,Chop the beans very well because they take more time to cook than other veggies.you can also blanch them first and then cook.Another option is that cook beans first then add other veggies. Step 5: Heat a pan and add 2/3 teaspoon oil when oil hotter then add 3/4 small size chopped garlic saute for some seconds,No need to brown the garlic then add finely chopped ginger. Step 6: Add 2 tablespoon chopped spring onion whites and saute for 2 minutes. Step 7: Add all the finely chopped vegetables and increase the flame to medium or high.Stir fry veggies. Step 8: You have continuously toss and stir while frying so that the veggies are uniformly cooked but don't get burnt. The veggies stir frying til the cooked or retain the crunch. Step 9: Add 3 teaspoon soy sauce,salt,1/2 black pepper powder.stir quickly and add rice. Step 10: Stir frying for a minutes till the sauce has coated veggies fried rice well. Step 11: Add 1 teaspoon vinegar mix all well. Step 12: Add chopped greens onion springs to garnishing for fried rice. Finally: The Vegetable Fried Rice is ready to serve with any hot Manchurian gravy dish.